One of the fun things about cooking is that there are many ways to cook just about everything. So if you see a recipe that looks good but you don’t have all the ingredients on hand, you can come up with creative alternatives. I couldn’t find red curry paste. Now, if I had a better work ethic when it came to cooking, I probably could’ve tracked it down. I could’ve asked someone who worked there, or I could’ve tried another store. I’m a hard-working writer, but I’m a lazy cook. 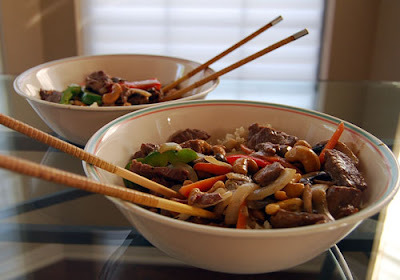 So I modified the recipe and came up with Thai-ish Cashew Beef with Garlic Brown Rice. I used stewing beef, which was too gristly, but other than that, this was delicious. Mix the marinade ingredients, adding more cayenne if you like spicy food. 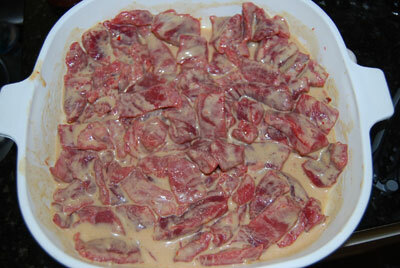 Pour half the marinade over the beef in a non-reactive bowl. (I feel so smart for saying “non-reactive” like I know what I’m talking about!) Allow to marinate for at least a couple of hours. Reserve the other half of the marinade. Heat 1 teaspoon of peanut oil over medium-high heat in a wok or a deep skillet. Brown the beef, trying not to stir too often. It’s difficult to resist the temptation to stir, but the beef will brown better if you let it be. Remove the beef to a large bowl. Add a little more oil to the pan and cook the vegetables until the carrots are crisp-tender, just a couple minutes. Put them in the bowl with the beef. Then pan-roast the cashews for about 30 seconds in a little more oil, just until they become fragrant. Put them in the bowl with the beef mixture. Toss and serve over Garlic Brown Rice. Heat the vegetable in a heavy-bottomed pan over medium heat. 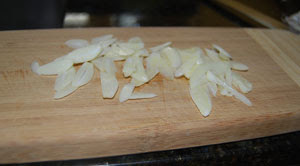 Sauté the garlic slices for about 30 seconds, then add the rice and water. Raise to a boil. Once boiling, lower the heat and cover the pan. Simmer until all the water is gone, about 50 minutes. Voilá! Doesn’t it look pretty? Oh man I think I drooled a little. Looks fantastic and easy to make. Thank you for sharing! Hugs back at you, Vikki! It is really good, and I think the marinade would work well with chicken, too. Maybe even shrimp. I love Thai. I never make Thai though. I should. I really should.